Advance CTE wrote a series of blog posts profiling the policies and practices of free college in the United States. This post will explore the future landscape of community college. 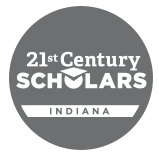 Check out previous blogs on the history of free college, Indiana’s 21st Century Scholars Program and challenges and limitations to free college programs. As of September 2018, there are over 350 local and state college promise programs across the country. Though the source of funding for free college varies , the goal of increasing access despite the growing cost of college is the commonality. So far, the 2018 election cycle has seen a number of candidates include some form of free college in their platform. Overall, ten Democratic gubernatorial candidates are promoting free college in their campaign. For example, Maryland gubernatorial candidate Ben Jealous is advocating for free community college and debt free four-year college, Arizona gubernatorial candidate David Garcia is supporting a proposal to make four-year public colleges free and Connecticut gubernatorial Ned Lamont is proposing making the first two years free at any state public college. At the federal level, various members of Congress have introduced legislation that promotes free college. Perhaps most well known is Senator Bernie Sanders’ (VT-I) “College for All,” proposed in the spring of 2017, that promotes measures such as making all public colleges free for learners with a household income of up to $125,000 and having all community colleges be tuition free. In the spring of 2018 Senator Brian Schatz (HI-D) introduced the “Debt Free College Act” that proposes measures to make college debt free with a focus on the total fees associated with college (such as textbooks, food and housing) instead of only tuition. 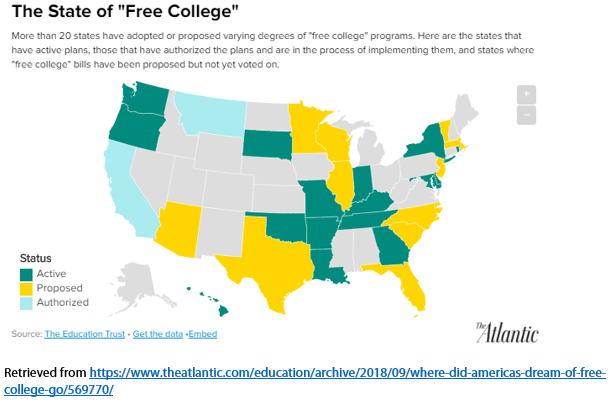 Although there is a growing national focus on free college, and even more state-level attention on this issue, a uniform agreement on what this should look like is lacking. There is no general consensus on what free college should look like and the scope of what “free” would truly mean. However, the overarching common goal of making college affordable and accessible will keep the conversation around free college moving forward.